India Farmers have planted wheat in 9.13 lakh hectare so far in the ongoing rabi season of 2018-19 crop year, up by 58.50 per cent from the year-ago period, according to the Agriculture Ministry’s data released Friday. However, area sown to all rabi (winter) crops was lagging behind at 84.91 lakh hectare so far this season as against 93.01 lakh hectare in the same period last year. Sowing of rabi crops begins from October and harvesting from March onwards. 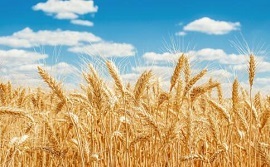 Wheat is the main rabi crop. As per the ministry’s latest data, wheat acreage has increased substantially to 9.13 lakh hectare so far this rabi season from 5.76 lakh hectare in the year-ago period. Much of the increase in wheat acreage was from Madhya Pradesh, Uttar Pradesh and Punjab. Similarly, oilseeds acreage has increased marginally to 29.89 lakh hectare from 29.31 lakh hectare in the said period. However, rice acreage was lagging behind at 4.21 lakh hectare as against 5.65 lakh hectare, while that of coarse cereals area was lower at 9.61 lakh hectare as against 16.52 lakh hectare in the said period. Pulses were planted in 32.07 lakh hectare so far this rabi season, slightly lower than 35.75 lakh hectare in the same period last season.